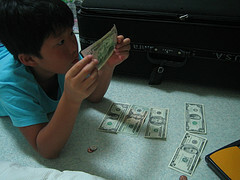 From an early age, I have always held some type of curiosity about money. How to best make it, handle it, save it, invest it, and give it. As I was pondering this fact a few days ago, I was reminded of several different people who have had either a major or minor influence on how I currently view and handle the money that God has allowed me to manage for His Kingdom. This is certainly not a comprehensive list of people who have had an influence on my current financial mindset. There have been numerous others who have had some type of impact on my life, but this list of twelve is certainly a great representation of those from whom I have learned the most from, whether it was through a book they wrote, a class they led, or a life they lived out as an example to me and others. Please note that even though there are only eleven numbers below, my parents do count as two people, making my total number twelve. I didn't accidently leave one person off my list. My Mom and Dad. I have never viewed my parents as being as obsessive-compulsive about money as I may tend to be, but growing up in my parent's home, I was really given an incredible working example of how to handle family finances. They taught me how to open and handle bank accounts at an early age. They encouraged me and my brothers to have some type of part-time job as young teenagers. They were fairly frugal with their money. We went out to eat maybe 1-2 times a week, and nowhere extremely expensive (Little Caesar's Pizza and Long John Silver's were pretty standard fare around my house). My mother cooked meals at home at least 4-5 nights a week. My parents had some type of petty cash system (they hid their weekly cash in a tin container, up on a high shelf where 3 sneaky boys couldn't get at it very easily). My dad also faithfully wrote out the tithe check and inserted into the church giving envelope every Saturday evening and placed it near his wallet and keys so that he would remember to take it to church with him on Sunday mornings. Thank you mom and dad for being positive financial role models for your sons. David Chilton. In my early twenties, I swiped David's book The Wealthy Barber from my parent's bookshelves. This was one of the early financial books for the "everyday man" that teaches the important concept of consistently investing something for retirement from an early age as well as additional common sense advice to become financially independent. Ron Blue. At some point in my mid to late 20s, I did some type of church Bible study or devotional program on Biblical finances called Master Your Money that was written by Ron Blue. Honestly, I don't remember any particular direct influence of his, I just remember that this was my very first encounter with the rudimentary concepts of Biblical finances. I believe it was around this time that I started tithing regularly. I had finally completed my master's degree and had landed my first decent paying job. Bart Nill. Bart is a friend who used to work as a midwest regional director for Crown Financial Ministries who I got to know through his leading our church staff through the 10-week Crown Financial Bible Study in the early 2000s. Even though we as a staff were not particularly excited to go through this lengthy Bible study during a busy fall season, Bart's passion for money principles based on God's Word left its mark on my life. 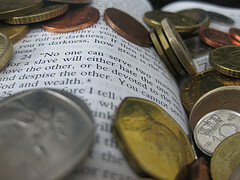 This is when I really started to understand what God's Word taught about money. Thank you, Bart, for passionately teaching me God's principles of money management. I will never view personal finances the same ever again. Howard Dayton. Through Crown Financial Ministries and Howard Dayton's books and Bible studies, this man has probably left the biggest impression in my current financial mindset that I am simply a manager of God's money. He owns everything. The money I currently possess needs to be handled in such a way that pleases Almighty God and serves His Kingdom purposes. Dave Ramsey. Around 2005, I was walking through a local bookstore and happened to stumble across this bluish-green book called Financial Peace by some author I had never even heard of named Dave Ramsey. I flipped through the book a couple of times and just knew that I needed to read it. Through Dave's book and radio program, my view of debt was transformed. Through following Dave's baby steps, I was able to become completely debt free in 18 months. Paul Brooks. My senior pastor is one of the most generous Christians I have ever known. Whenever He preaches a sermon series on stewardship, giving, or a capital campaign, I believe what He is preaching because He lives out what He preaches regarding a life of giving and generosity. If it were not for my pastor, I wouldn't be a stewardship pastor. He saw the potential in my life concerning Christian money matters way before I ever did! Robert Kiyosaki. Robert's book Rich Dad, Poor Dad is one of those "must have" financial books for your personal library. It has had a tremendous influence on how I view assets, liabilities, investing, and business practices. Obviously, Robert's book also influenced the title of this blog. Thomas Stanley. Through his book The Millionaire Mind , Dr. Stanley really helped me understand how the average millionaire in America really lives. We have a certain view of how rich people live based on what the media tells us. Through extensive research into the lives of average millionaires, though, Dr. Stanley uncovered the real story of the everyday American millionaire. They run economically frugal and productive households. They live in lovely homes located in fine neighborhoods. Balance is their approach to life. They are financially independent, yet they enjoy life - they are not "all work, no play" type of people. Neither their lifestyle nor their wealth was generated from being highly leveraged financially. They are not credit junkies. The lesson that Thomas Stanley discovered from these millionaires was this: You cannot enjoy life if you are addicted to consumption and the use of credit. Randy Alcorn. Through his book The Treasure Principle , Randy has given me a completely new perspective on joyful giving. Christians should give out of "enlightened self-interest" in order to build-up the Kingdom of God while we are living here on this earth. Our time here is extremely short. Eternity is forever. We invest into our eternal future by grabbing hold of the best investment advice you will ever hear: "Store up for yourselves treasures in heaven" (Matthew 6:20). Every believer in Jesus Christ needs to read this book! Ramit Sethi. Over a year ago, I read the book I Will Teach You To Be Rich by blogger and author Ramit Sethi. I had been a follower of Ramit's blog for a while and ordered his book when it was first released. While I don't agree with everything that Ramit teaches on personal finance, I put into practice the advice he gives on conscious spending, optimizing your finances, and automating your finances. He gives some great insights on mastering your money with the least amount of effort - and then getting on with your life. So, who has had a major impact on your personal finances and why? Feel free to leave a comment below and share with me and my readers who has shaped your thinking on money. Many of these same people have really influenced my thinking in faith-based personal finance as well! My favorite treatise on financial stewardship is Randy Alcorn's book Money, Possessions, and Eternity. I've heard a lot of positive feedback about Randy's Money, Possessions, and Eternity, but I just haven't gotten around to reading that one, yet. So much too read, so little time! I need to put that book on my Amazon Wishlist.